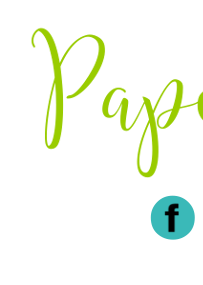 If you aren't following Paper, Paint and Pine on Instagram you should! You can also visit the Shop for paper goods and some handmade wooden items like Key to Decor Beads? I don't know if you've heard but I have a new niece. She's 4 months old and it's her first Easter! I am looking forward to having a basket for her filled with cute girly things however I needed a cute basket first. 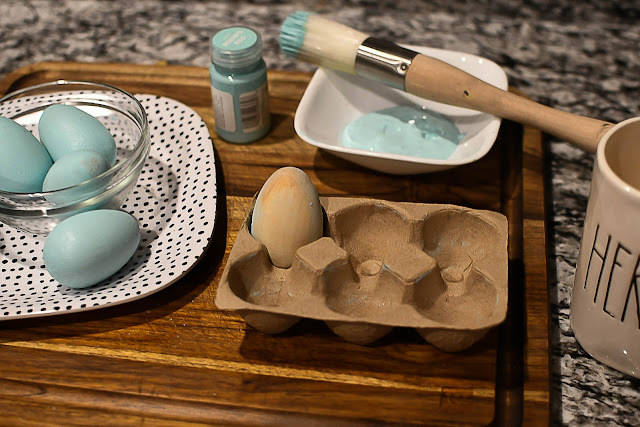 I searched Pottery Barn Kids and they were cute but didn't wow me so I decided to go the inexpensive route and make my own. Two of my favorite things...budget friendly and a craft! "If you’re looking for some of the best heat transfer vinyl on the market you’ve come to the right place. We carry Siser heat transfer vinyl. Heat Transfer Vinyl World let’s you shop your way. By COLOR. 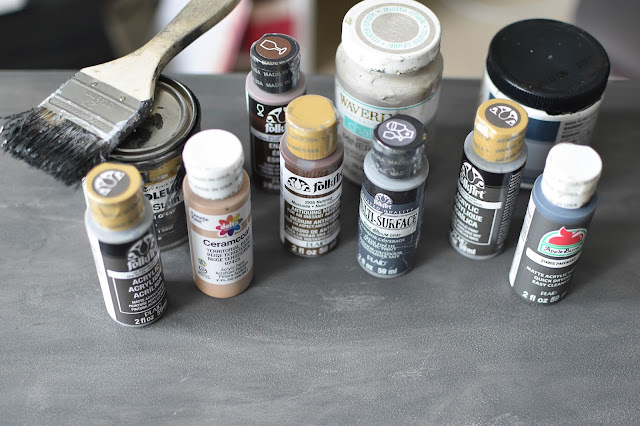 Choose your base color and see hand-picked accent colors that complement any color for any project. 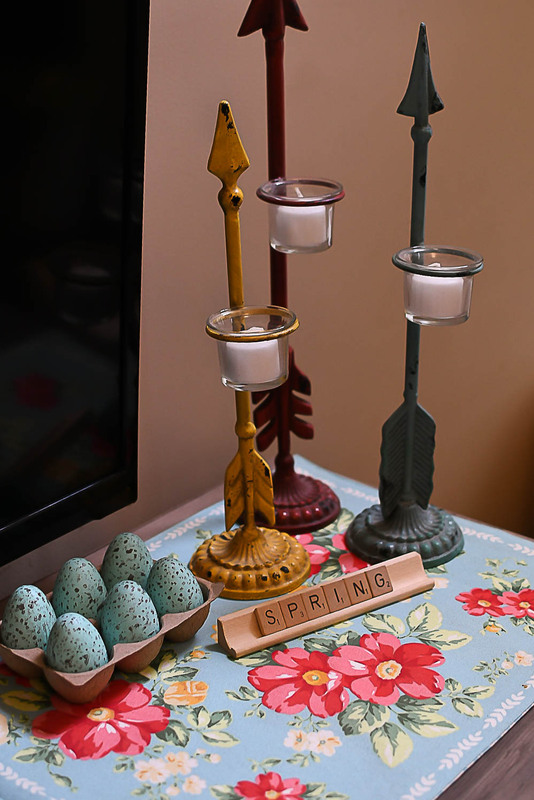 Never get stumped again and find colors that work for you. HTV World is dedicated to making your shopping experience a breeze." 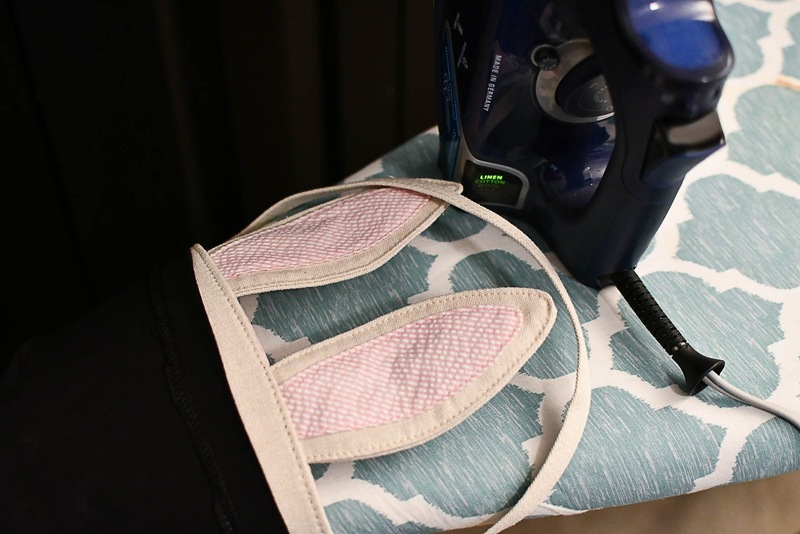 They have such an easy way to shop because every color gives you several coordinating colors and styles of heat transfer that will go with your pick. I loved shopping with them and they have a great assortment of styles and the quality is top notch! 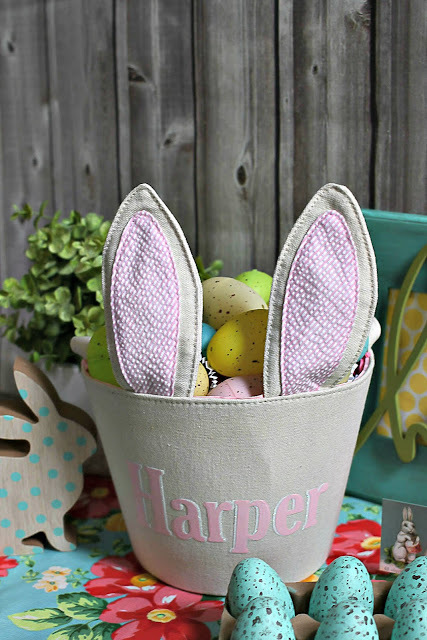 I found my cute little bunny basket at Target in their dollar section for and knew I had to do something to make it just a bit cuter so I went straight to HTV World and snagged some colors that would work perfectly for her basket. I went with pale pink, white glitter and solid white but didn't end up using the solid white for this project so I'm sure you will see another post down the line where I use it. 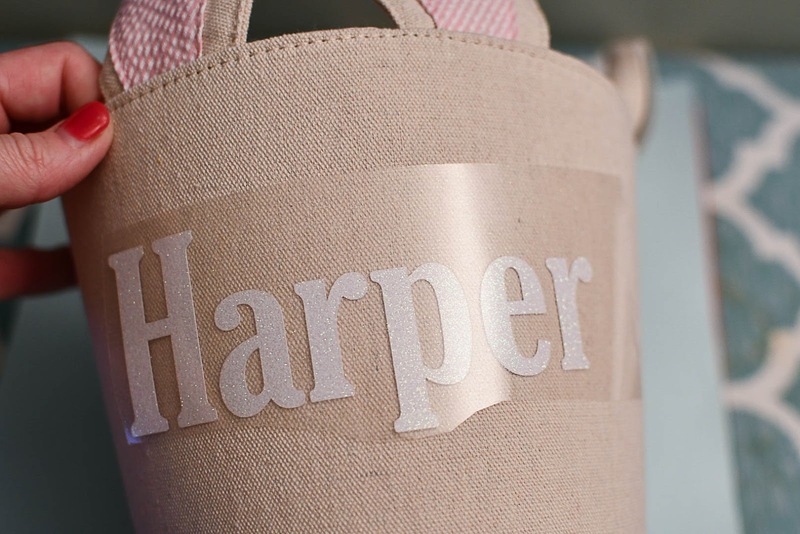 I used my Silhouette machine to create the decal using just her first name and then mirrored the image and cut it out of the pale pink and then the glitter white. Once my HTV was cut I did the weeding (taking off excess material around the letters) and prepared my iron to get it ironed on. I dumped the water out of my iron so there wouldn't be any steam and set it to the linen setting and let it get good and hot. I then placed my decal using the glitter htv first and due to it being a curved surface I did cut the word in half to make it a little straighter. 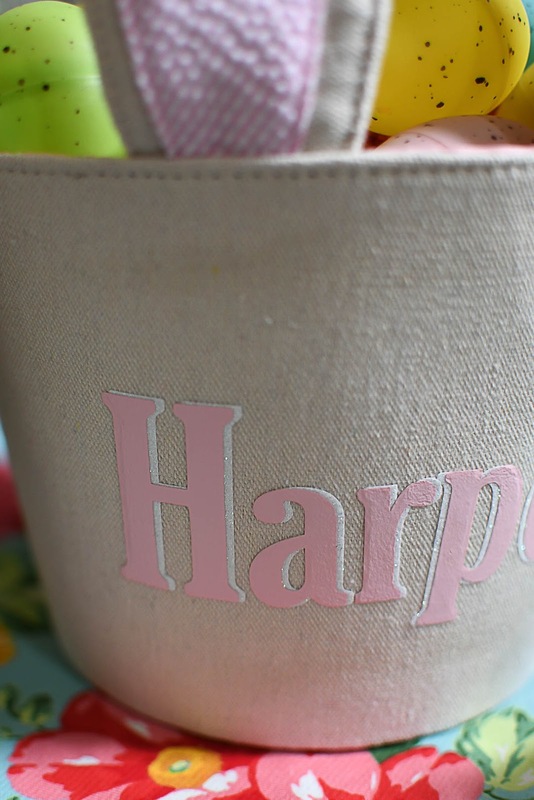 I placed my basket over the end of my iron so I had a surface to press the basket and decal on. 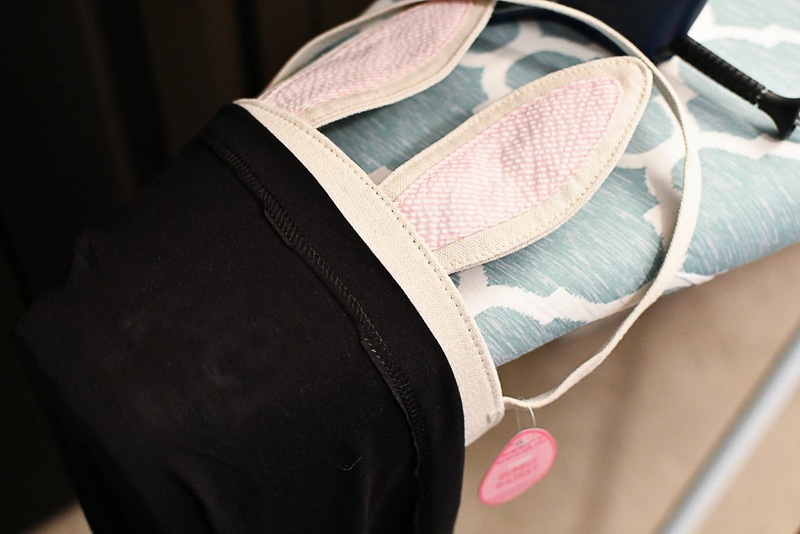 I then placed a thin piece of fabric over the decal to protect it from melting onto my iron. I just use a tshirt and just use one layer of it and it works great. Once the tshirt was covering it I placed my hot iron on it without moving it too much so it wouldn't move the htv. 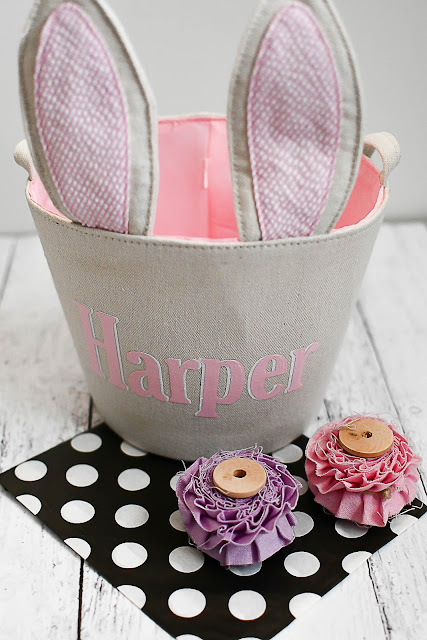 Once I knew it was secured enough to the basket surface I started slowly moving my iron over it while applying pressure and then once the backing was coming off the vinyl I slowly removed it and had an adorable basket! After I did the glitter layer I then placed the pale pink layer over top of it but moved it just slightly over so the white glitter would just peak out. Most people would probably put the smooth vinyl down first and then do the glitter but I wanted the glitter to just be an accent. How easy is that? 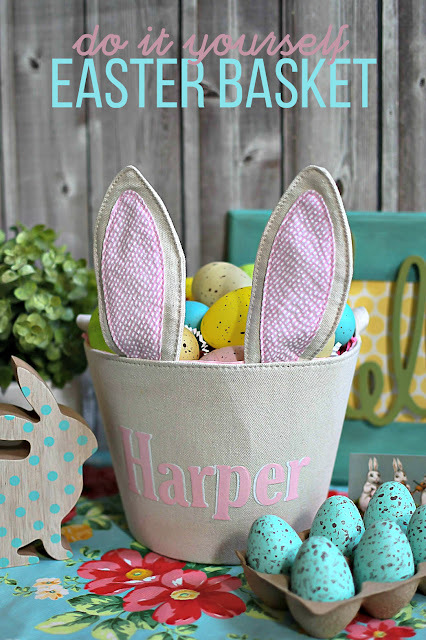 So simple but creates the cutest little basket for so cheap! Isn't it so cute? I just love that little accent of glitter sticking out! Moral of the story? 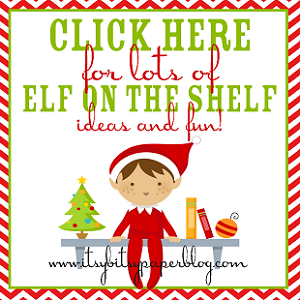 Go visit HTV World for your heat transfer projects! Oh where has the time gone? 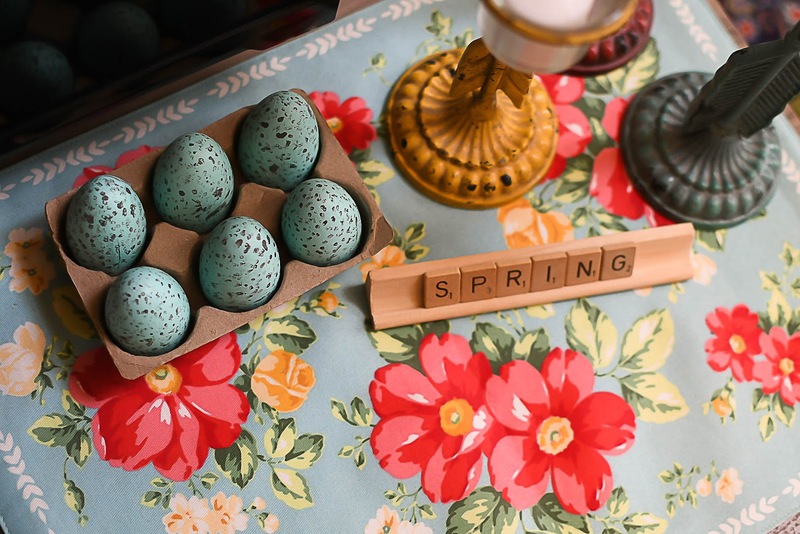 I feel sad that I haven't blogged in such a long time but also I feel like so much work goes into blogging and sometimes I wonder if anyone is reading because most the time I get very little response to my posts. That all being said I miss sharing my creative adventures with you. 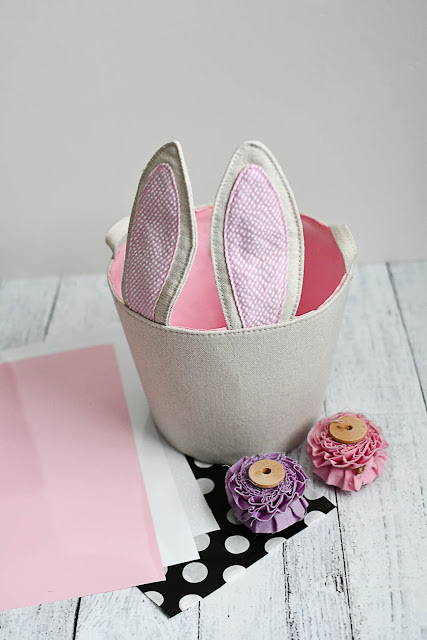 I thought I'd kick off with a super simple project for spring or Easter. I know a lot of places are carrying solid wood eggs or even just white plastic eggs and either would work for this project. 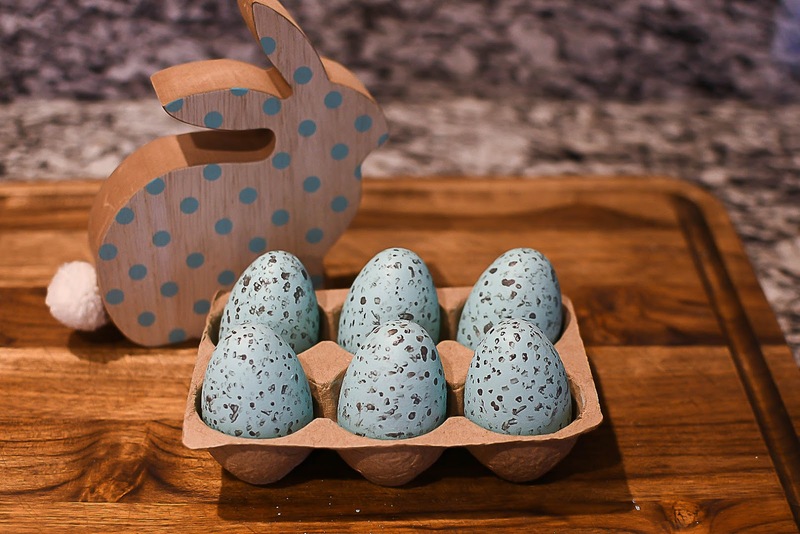 I used solid wood eggs from Target. I found them in the dollar spot so you can't beat the price. 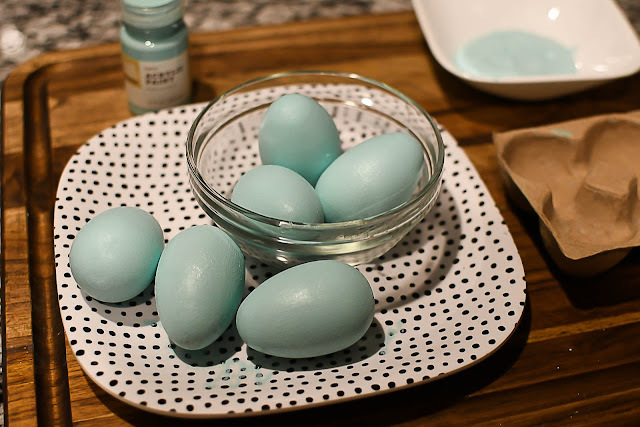 I then bought a bottle of acrylic paint from Target in a color called Robins Egg. 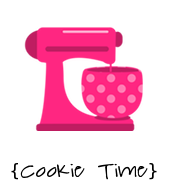 Perfect name for this project. 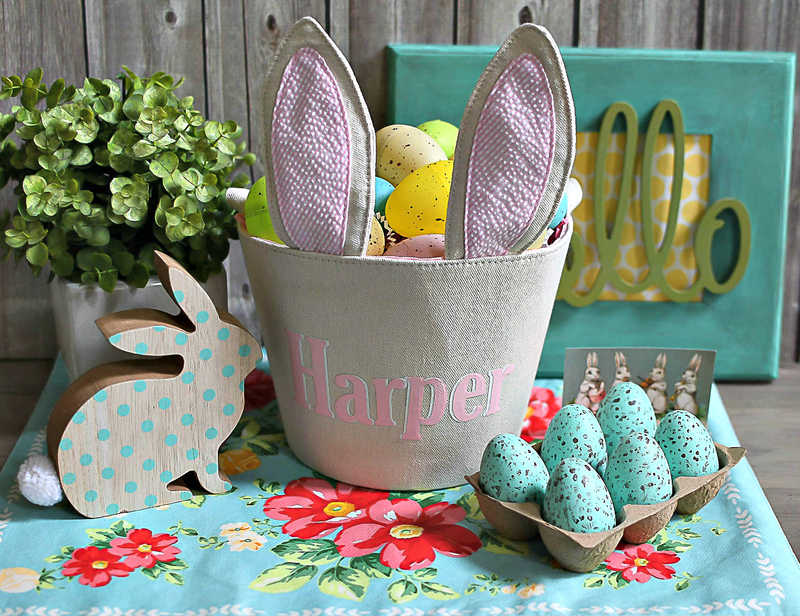 Perfect for your spring decor! 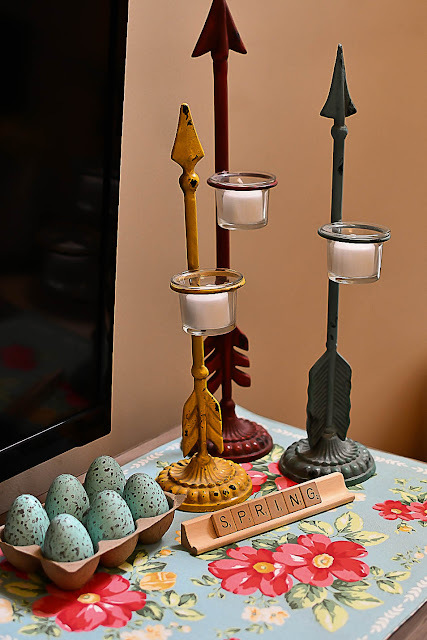 I picked up this brush at Lowe's Home Improvement and love it for anything that is round like finials or beads or candle sticks...you get the idea. 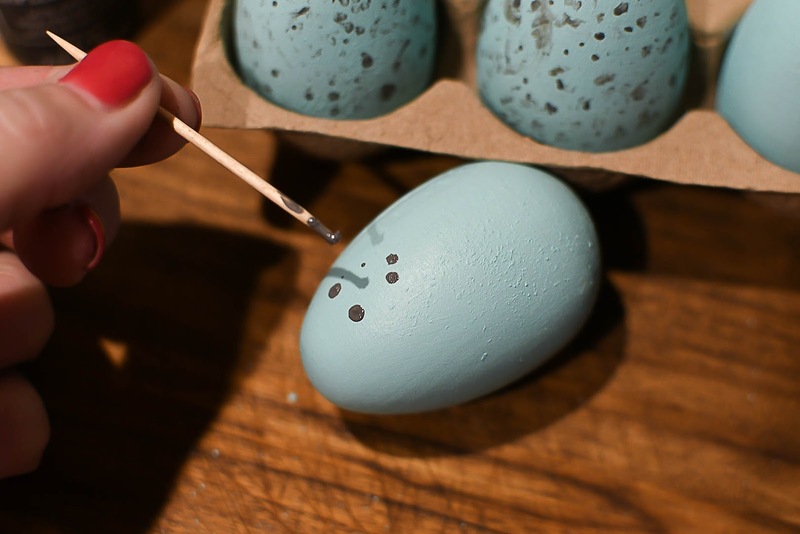 Makes brushing paint onto round object so much easier! 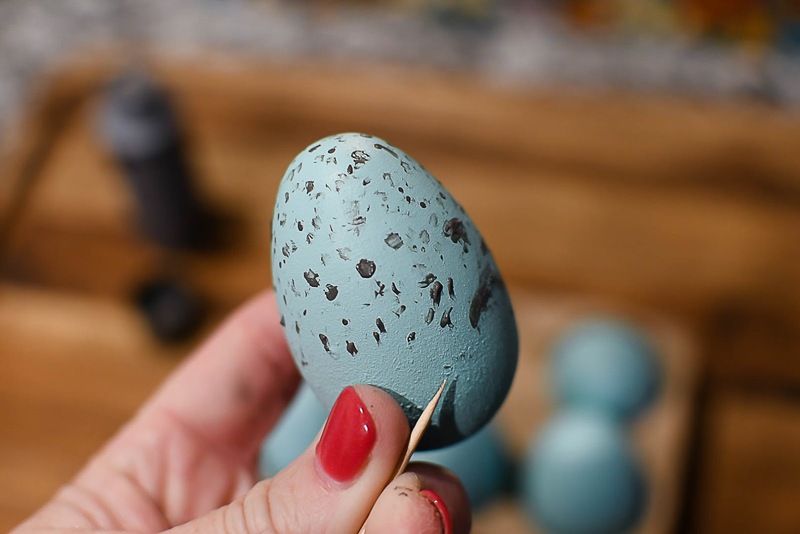 I painted all the wooden eggs with 2 coats of the acrylic paint and let them dry well before I started adding the spots that a typical Robin's Eggs have on them. 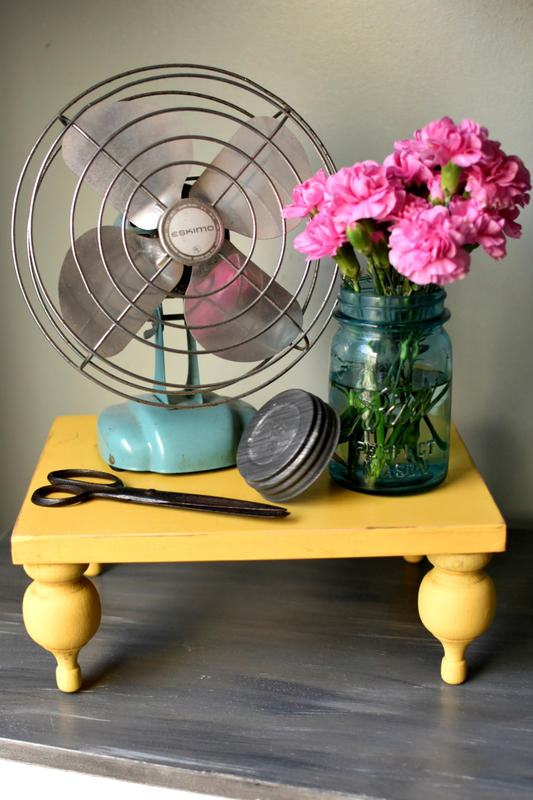 These are perfect just with the plain paint on them too so feel free to stop at this step! Just start lightly dabbing the paint on with your toothpick. I went through a couple toothpicks because they would flatten out and the spots got too big but that is fine if you like that look. Don't worry if all the dots aren't the same size or if they get a little smeared. They don't have to be perfect because in nature they wouldn't be perfect either. That is it! Put them back in the cardboard holder or a cute egg basket and you are all set with another cute decor item for spring! 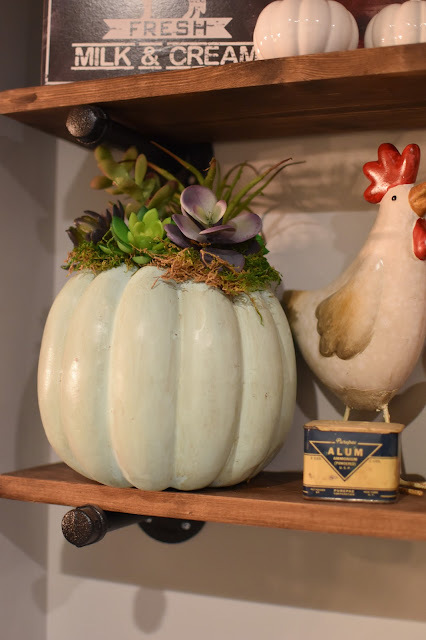 Don't mind the large black TV behind this little vignette...it just happens to be where I needed to add a little something to spring this area up. 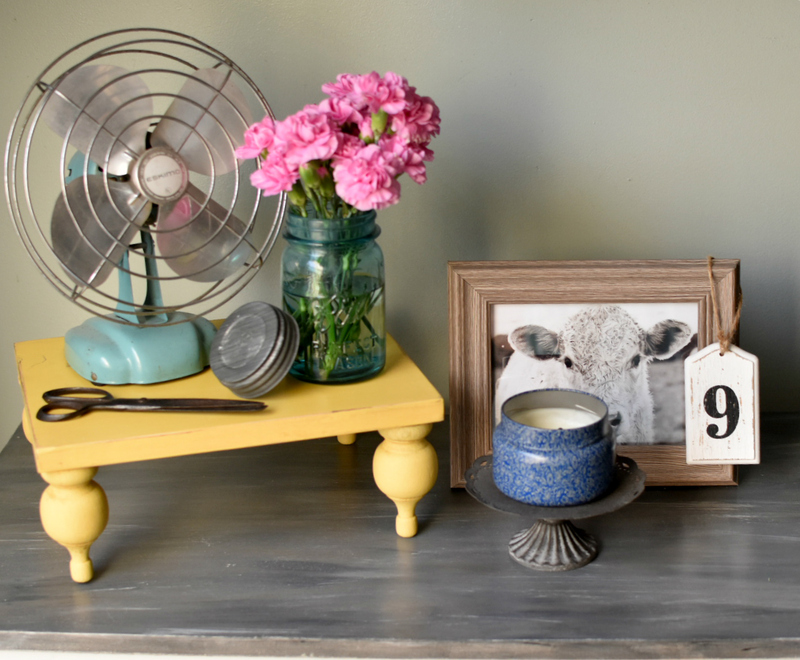 Don't you love a quick and simple DIY? I know I sure do! It has been way too long since I sat and wrote a blog post but after putting several videos up on my Instagram I had quite a few messages asking me to share this technique. 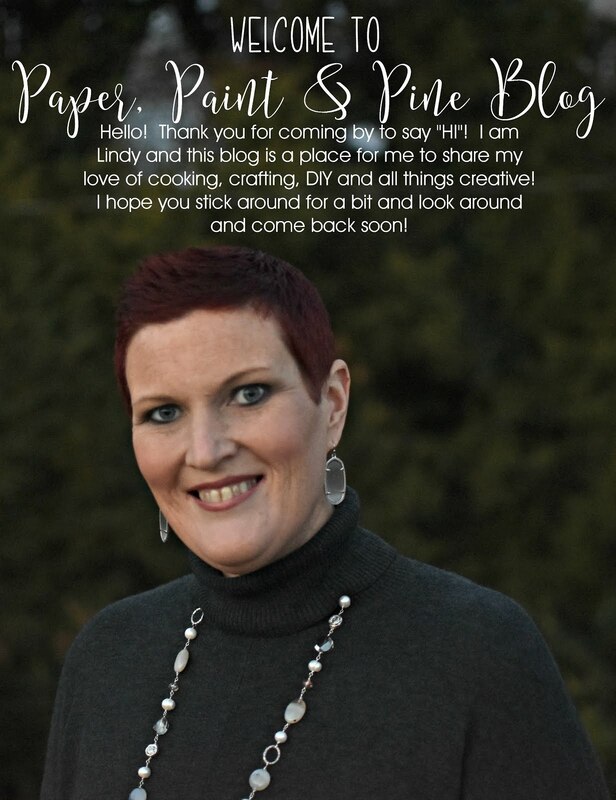 I have missed blogging and the community of friends I've made here but haven't felt much motivation to write a post until now. Here is to hoping I get back to it regularly! 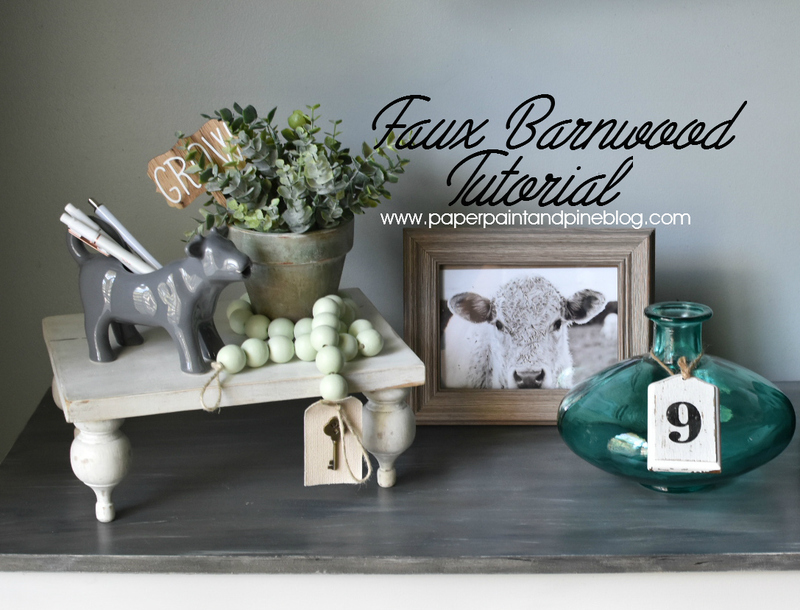 Now on to what this post is really about...Faux Barnwood! 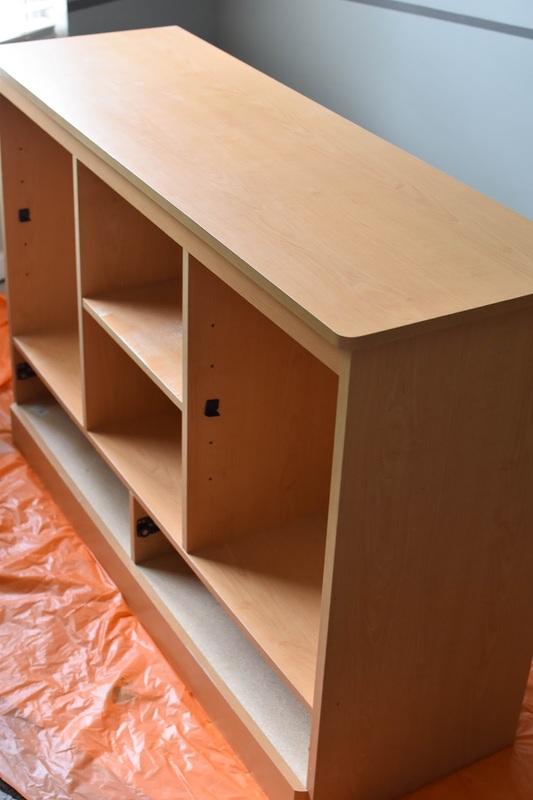 I have this ugly desk and shelving unit in my office and have been dying to get something new but just hadn't found anything that would give me the same amount of storage so I had planned on building something or making an Ikea trip and buying individual pieces and building around it. 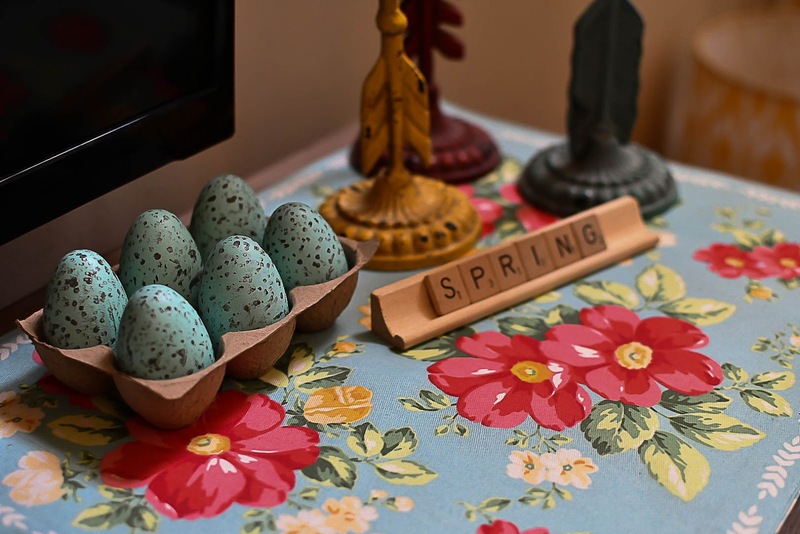 However that day didn't happen and I was getting more and more tired of looking at the awful laminate so I woke up one day and knew just what I wanted to do with the furniture to give it a new life. So I got my white paint and got started but then I didn't like how white it was so I hopped on Pinterest and looked up faux barnwood and found several great tutorials but most weren't using laminate but real wood so I knew I'd have to do a lot more than just using stain. I decided to just go for it because worst case scenario was to paint right over it if it didn't turn out. I started with the desk first and as I got started I was convinced I had ruined it and it'd never turn out but two days later and about 12 paint colors I was in love! Don't worry you will not have to use 12 paint colors if you decide to do this and it will not take you 2 days like my first try did. Once I realized the colors and technique I liked I was able to do my shelving unit in less than an hour and my work table surface in just about 45 minutes. 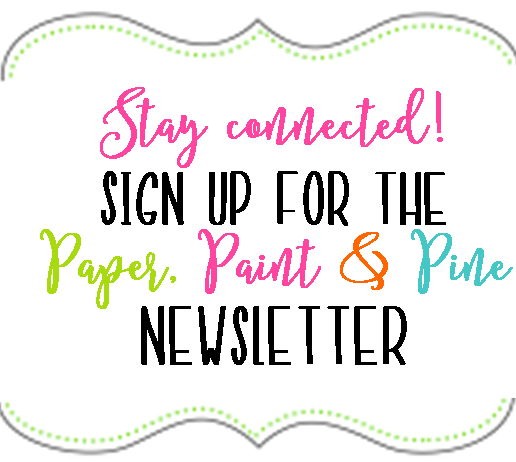 I am going to give general paint colors in the list of things you need however I will tell you exactly what colors I used. I know you may not have access to each of these colors so just something similar will work. You will want to do one light coat of primer over the surface you plan to use this technique on. I didn't do anything thick but wanted to make sure there was at least a little bit of primer to cover the laminate. Once the primer has dried you will use your Rustoleum Wood Stain in Carbon Gray. I started with a chip brush but found that it was much easier to just use an old t-shirt and rub the stain in that way. I didn't do a thick coat of stain and wiped as much off as I could. Honestly I liked it just like this but still wanted to add some color/dimension to it which is where the other paint colors will come in. Even though you saw all kinds of colors in the photo above these were the ones I ended up using. This is kind of a trial and error process so if you have other colors you want to add in I say go for it and know you can always just paint over it if you don't like it. I only used 1 chip brush for the entire process. It doesn't hurt for the colors to blend into one another so that is why I only used one brush for the whole project. 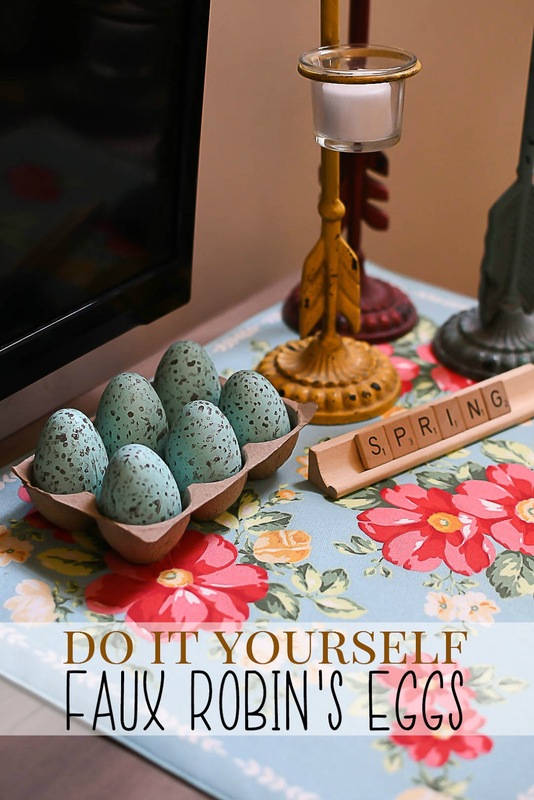 You will start with any color you want and very very lightly make swiping motions all over the desk with the desired paint color. I did this in quick sweeping motions and then once all the paint was off the brush I went back and blended it in by rubbing over it with the brush. Basically just blending it in so the streaks weren't so harsh. I did this with each color and then blended the whole surface with an old t-shirt so that it really softened the look. I then went back with some of the colors and added a little more and then blended it again. I did this until I was happy with the look. 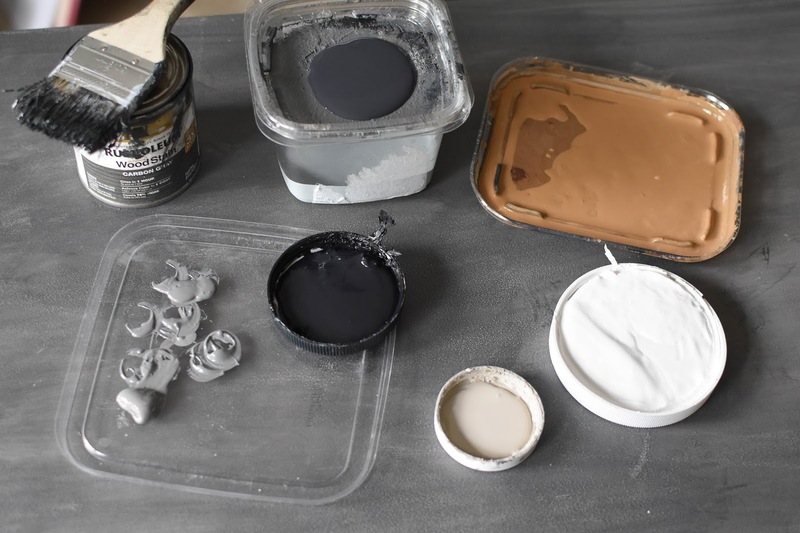 Don't worry if you are layering a ton of paint. Also do not give up if you think it's not looking right. I thought it looked horrible and almost threw in the towel many times but I'm so glad I didn't. There really isn't an art form on this but just keep at it until you are satisfied with the appearance. 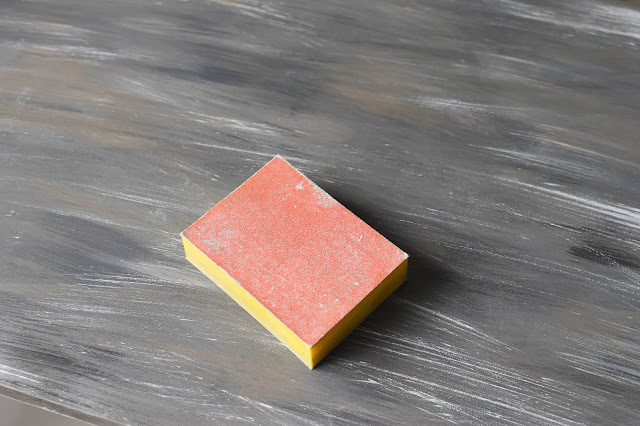 Once I was please with how the surface looked I used a sanding block and sanded the whole surface to soften it a bit more. 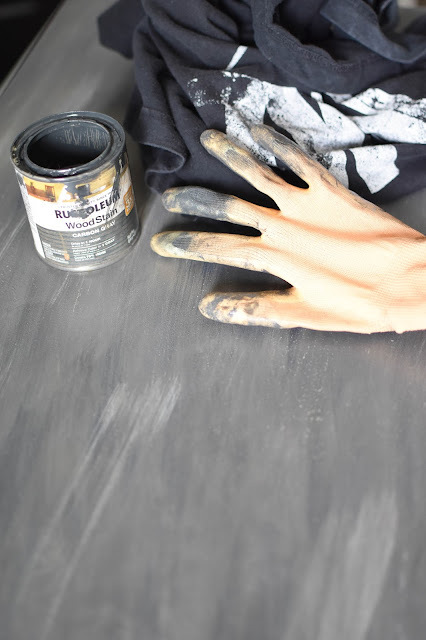 I then went back over it with more of the Rustoleum Carbon Gray Wood Stain to blend it all together even more. As you can see here once I went over it with the Carbon Gray it softened the surface so much. I went back and added a little touch of color here and there just to add a little more "streaking" that the carbon stain may have blended in too much. You wouldn't have to do this step though. Second to last step is to use the Antique White Wood Stain from Varathane and go over the entire surface. Again I used an old t-shirt for this and really used some pressure when rubbing it in so that it blended the colors really well. The final step is to seal it with Polyacrylic. I used 3 coats of this to really protect the surface. It gives it a nice smooth finish and because I used Satin it has just the tiniest bit of sheen to it. That is it! Don't let this project intimidate you because I promise it's easy. It's really just layering and playing with it until you are pleased with the results. I know you can do it! This was a labor of love but I sure do love how it turned out! 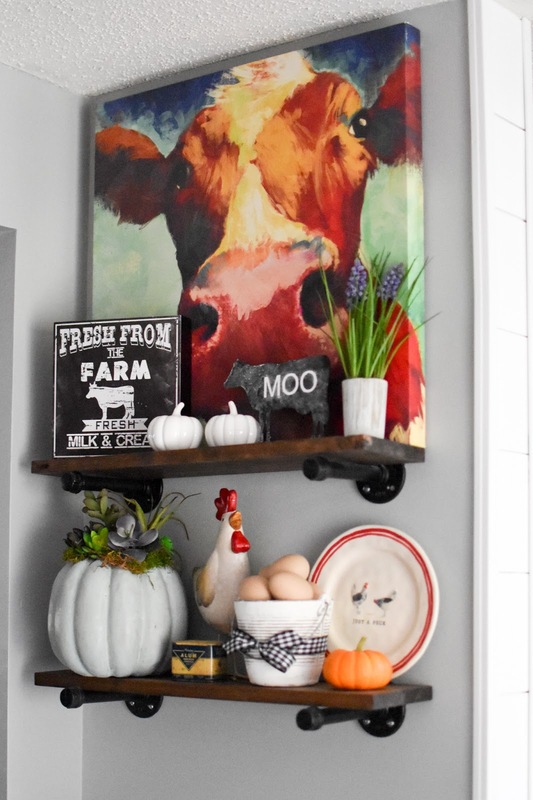 It was definitely worth the time and energy I put into it because I love the end result and so has everyone else that has seen it so that is a major win! 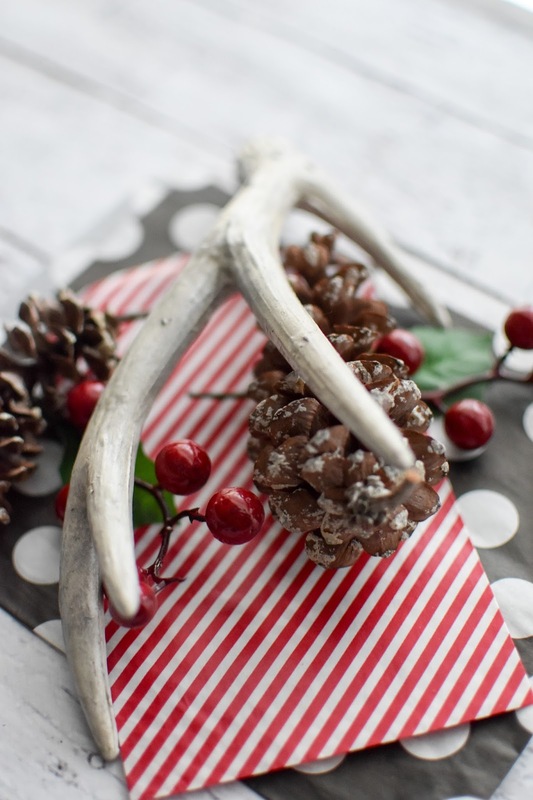 I love that antlers are making such a big appearance in decorating but I'm not a fan of the idea of a real antler sitting around. I know I might be odd but I just am not feeling having a body part of a live animal sitting in my house. I know that deer don't have to be harmed to get their antlers but it just creeps me out...call me strange. I do however love the look antlers give to your decor so when I ran across these silver metallic floral pick antlers at Michael's I knew I had a craft project. I picked these up before the holidays for around a dollar each so you really can't beat that! With the popularity of antlers I would imagine that the craft stores will continue to carry some form of antler in floral department. As you can see it's a pretty antler even in the silver but it's not the look I wanted. This was the look I was going for so that it'd look a bit more realistic so out came the spray paint and wood stain. First I used pliers to remove the floral pick by tugging it out. It was very easy to remove but if you can't get it off you could also cut it off right at the base of the antler. It does leave a tiny hole so if you wanted to fill that just use a little filler there. I didn't bother because I knew my antler would be displayed with things around it and you'd never see it anyway. 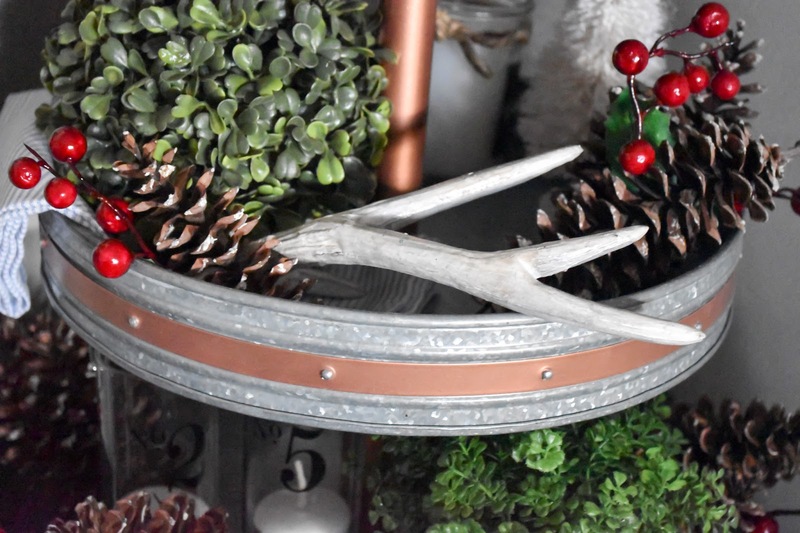 To achieve the look of a real antler I used Rustoleum Heirloom White spray paint. 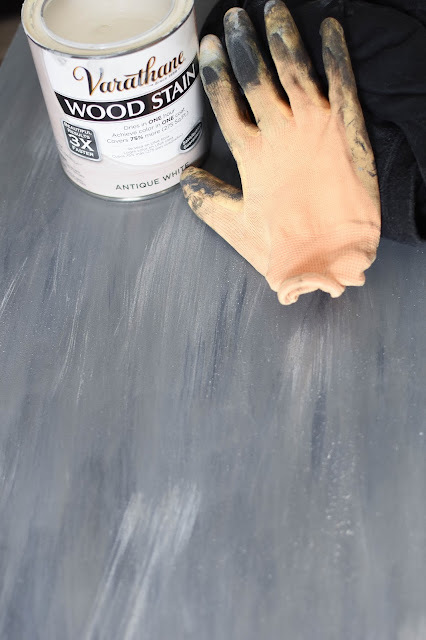 This is a gorgeous off white and works well for so many projects. 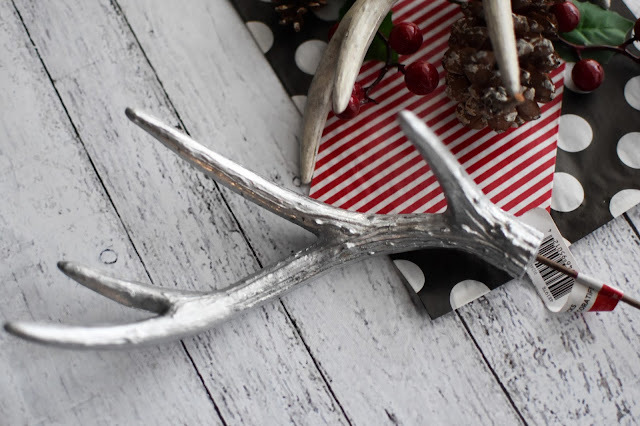 I didn't cover the antler entirely so that some of the silver color still showed through a tiny bit. It's really trial and error. I have done at least 5 of these now and every one of them turns out slightly different which I love so just play around with the coverage. 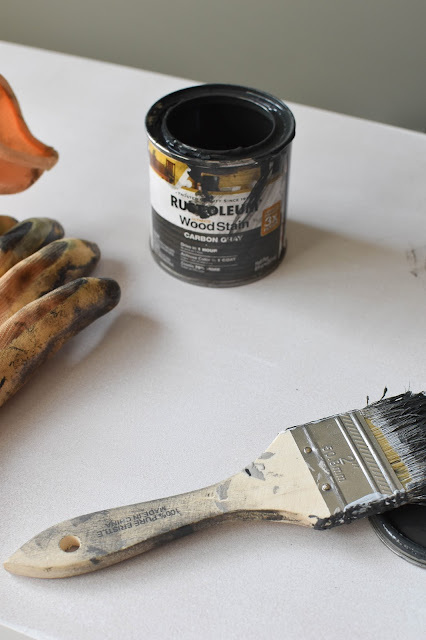 Once the spray paint is covering your antler on all sides and it's dry you will now need to use some wood stain. 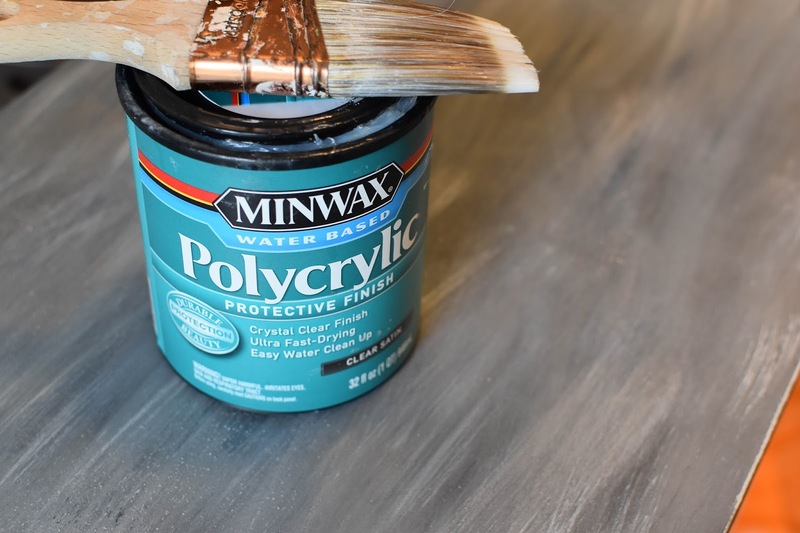 For my wood stain I used Minwax Espresso and Classic Gray. 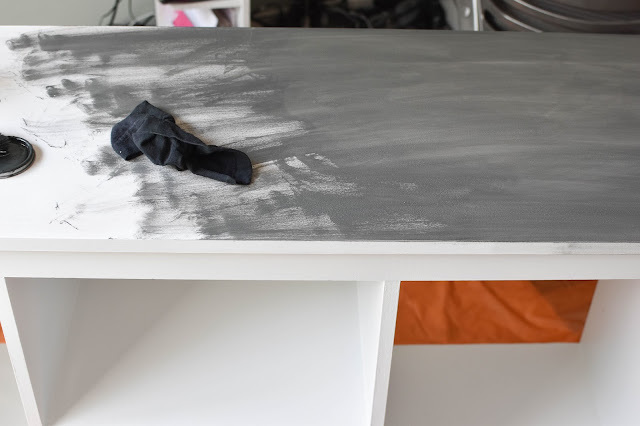 Always make sure to shake the Classic Gray stain because all the pigment sinks to the bottom and without shaking it you will get little to no coverage. I used an old tshirt and dipped it into the Espresso stain and quickly wiped it all over the antler. I then wiped the bulk of it right back off. I worked quickly so the stain wouldn't get too dark but if you don't work fast and need to redo it just add another layer of spray paint and try again. 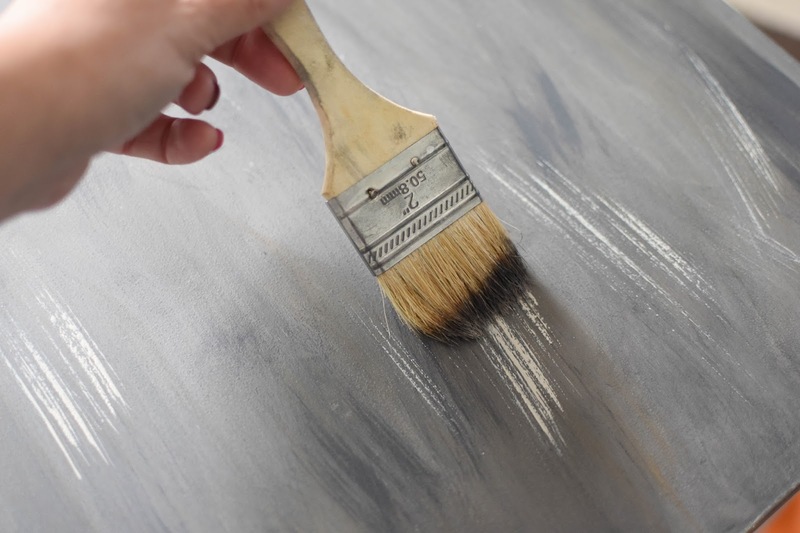 Once the Espresso stain is wiped off I then did the same thing with the Classic Gray. After I wiped the gray back off I then took my Espresso and dabbed it onto some of the raised areas of the antler so it would have tiny bits of dark spots and did a few areas in the Classic Gray stain as well. I let it dry and that was it. I know it may not be a perfect match to a real antler but I was certainly pleased with how it turned out. So pleased that I went on to make some for my mom and more for myself. I loved that each one turned out differently so they are unique. 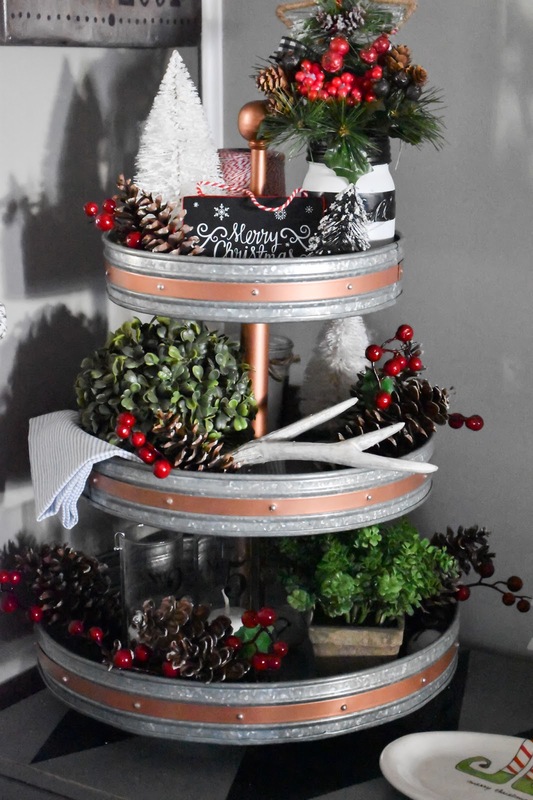 Even though these photos are from Christmas I will continue to use the antlers in my decorating long after the holidays. 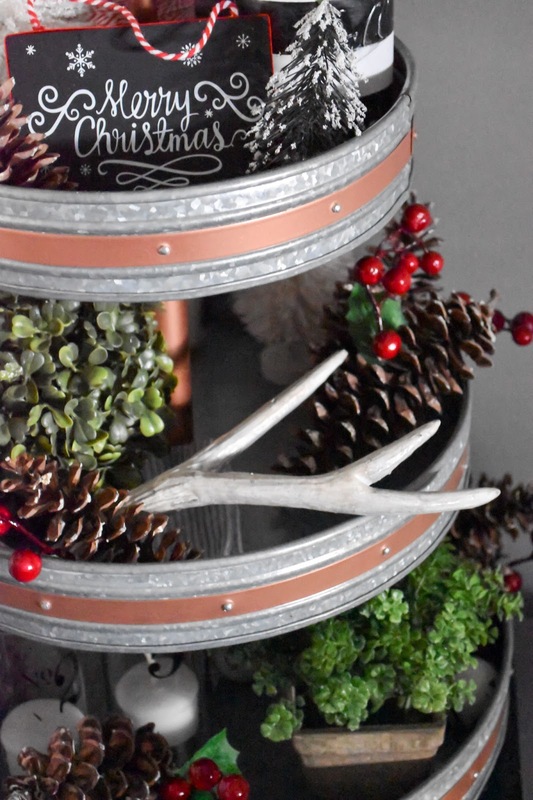 I hope you will take a chance and give this a try if you like the look of antlers in your decor. If you follow along with me on Instagram, and you should, you will maybe have seen my insta-story talking about trying out Pumpkin Spice Cheerios! I am the only one in my house that likes pumpkin so when I could only find a family size box I knew I had to come up with a way to use them up. I really like the flavor of them since I'm an all things pumpkin lover but it was still way more Cheerios than I can eat by myself. 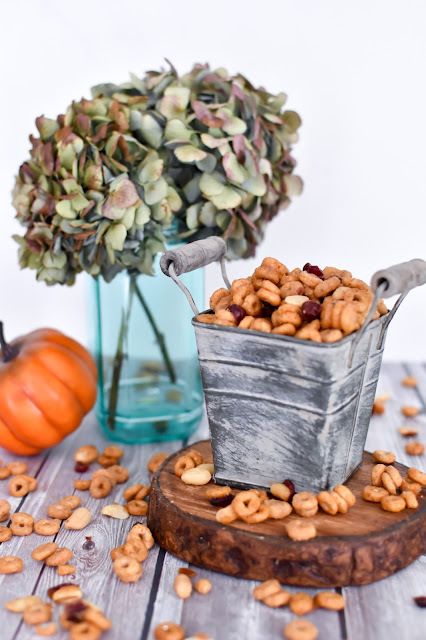 I pondered ideas and decided to use my Cheerios Snack Mix Recipe from several years ago but adapt it to work with the pumpkin flavor and boy did it turn out amazing! 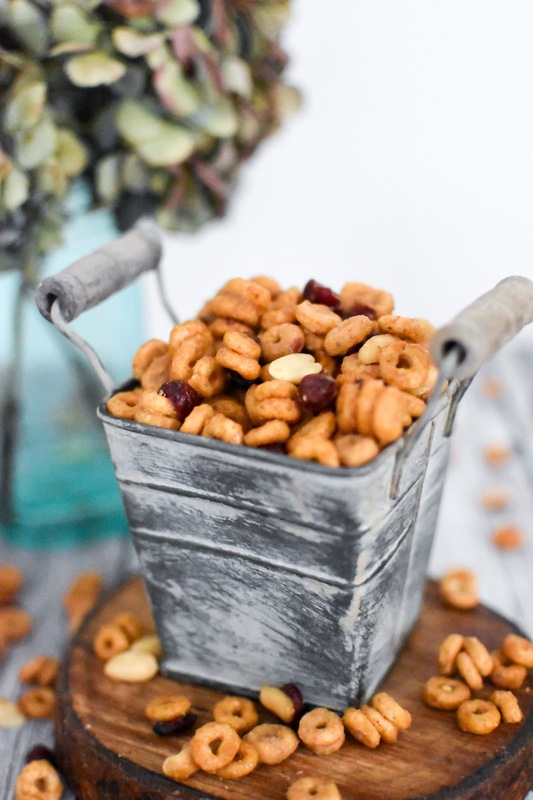 I did a insta-story on making the snack mix and was amazed at the response and people wanting to know the recipe so I figured I would do an updated post for you all to grab this recipe but if you want to make it with the original Cheerios the post is still up and you can click HERE to get to it. 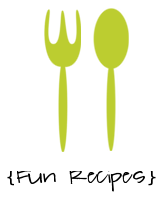 This is a fun recipe for kids to help with because they love the part where you add the baking soda to the Karo mixture and it gets all foamy! 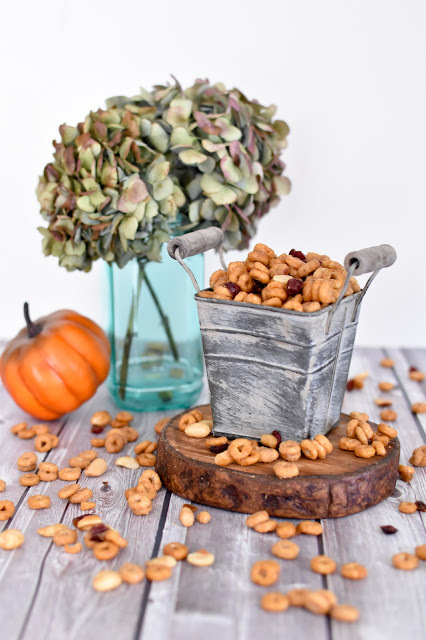 I just love the mixture of pumpkin spice and the dried cranberries with this new twist on the original recipe! This snack mix is usually a big hit and is something that a lot of people have never had so it's unique too. I hope you all enjoy it as much as my family does. 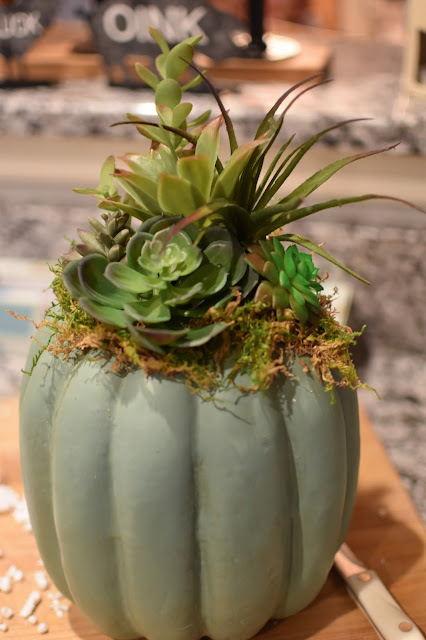 The other day I was cruising stalking Instagram which I tend to do and came across the prettiest faux pumpkins filled with succulents. It was done by my friend Amy @cutertudor (go follow her!) and they looked awesome. I had bought several cheap pumpkins at Walmart and had already started painting them and bought a bunch of inexpensive artificial flowers to fill them with but then when I saw her succulents that completely changed my mind about using the flowers. So flowers were out and I headed back to the store to spend a fortune on succulents. Let me tell you these little picks aren't cheap! 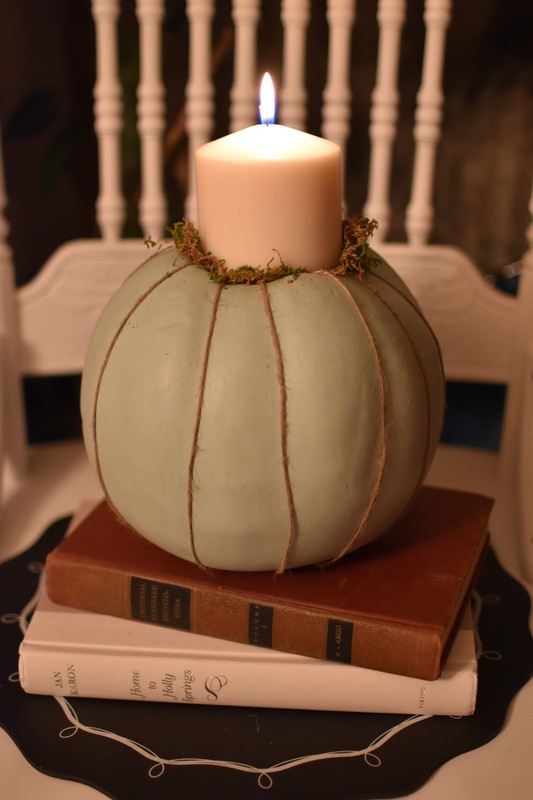 I had 20 bucks in one pumpkin so this isn't the cheapest project if you are wanting to keep it from breaking the bank. 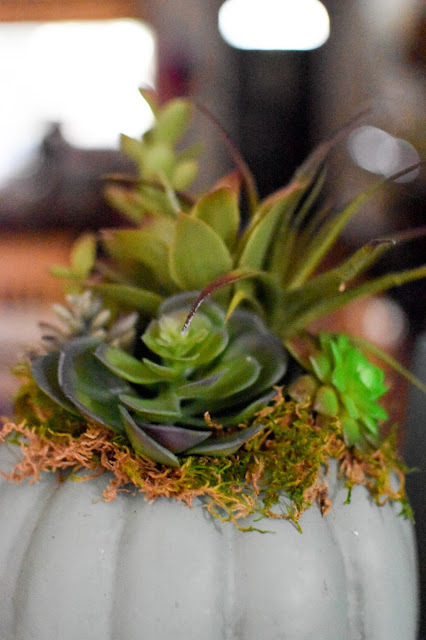 Anyone has a source for inexpensive succulent picks I'm all over it so please share! 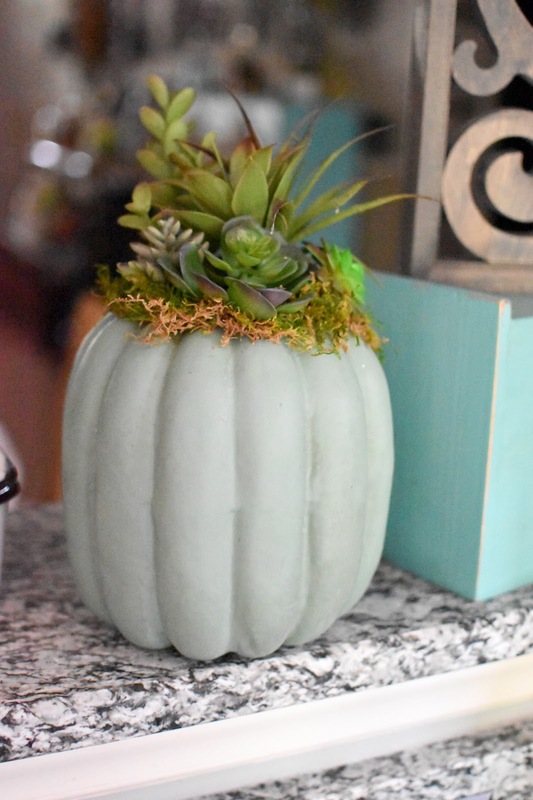 So armed with my succulents I went home and used Robin's Egg spray paint from Rustoleum to spray one of the pumpkins. I have never used this color before but have fallen in love with it! It's the prettiest light aqua! 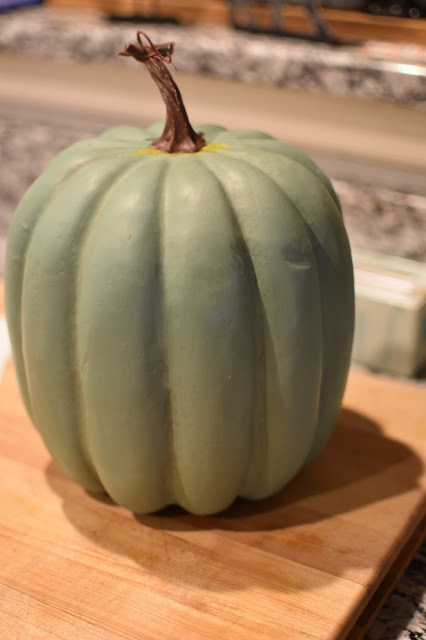 For the second pumpkin I used Martha Stewart's Vintage Chalk Paint in the color Eucalyptus and brush painted it. It takes a bit longer to brush it on but well worth it to use such a pretty color! 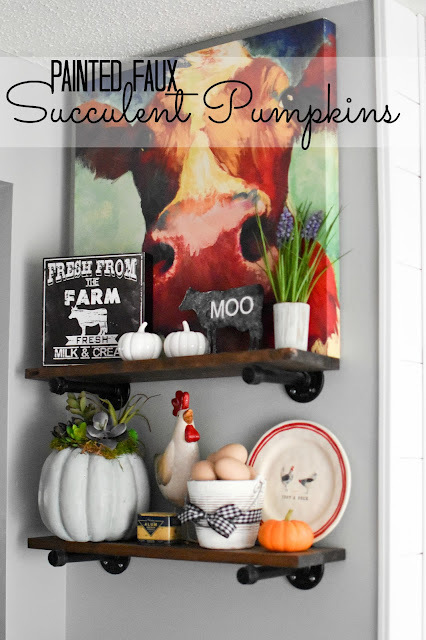 Once I had my pumpkins painted I then used my Minwax Furniture Paste which is my bestest friend for all paint projects. I let it dry and then buffed it up and it left the prettiest finish and was so silky to the touch! Now for the fun part! 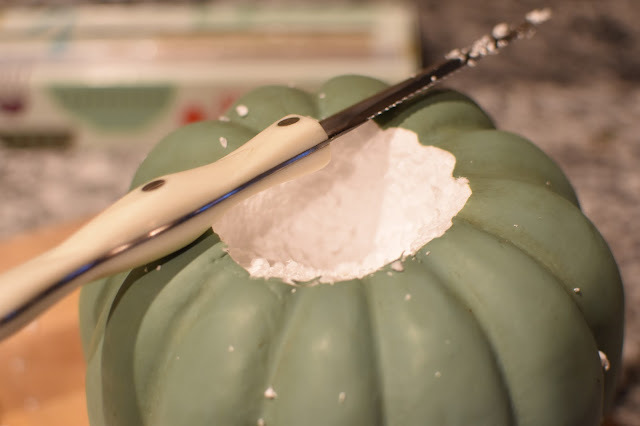 I used a serrated knife and cut a small circle in the top of the pumpkin and scooped out some of the styrofoam. I would start with a samll circle because it's easier to make it bigger than to try to shrink it down after you made it too big. 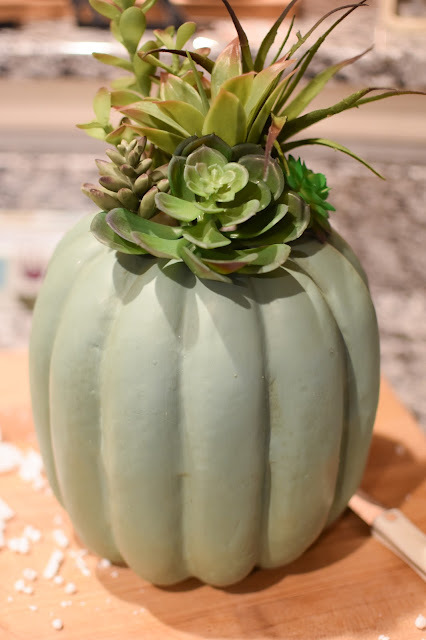 Then I just started placing my succulent picks where I wanted them and of course because the inside of the pumpkin is styrofoam it's super simple to dig the sticks into it so they hole well. Once you get those arranged just the way you want them you are just about finished. 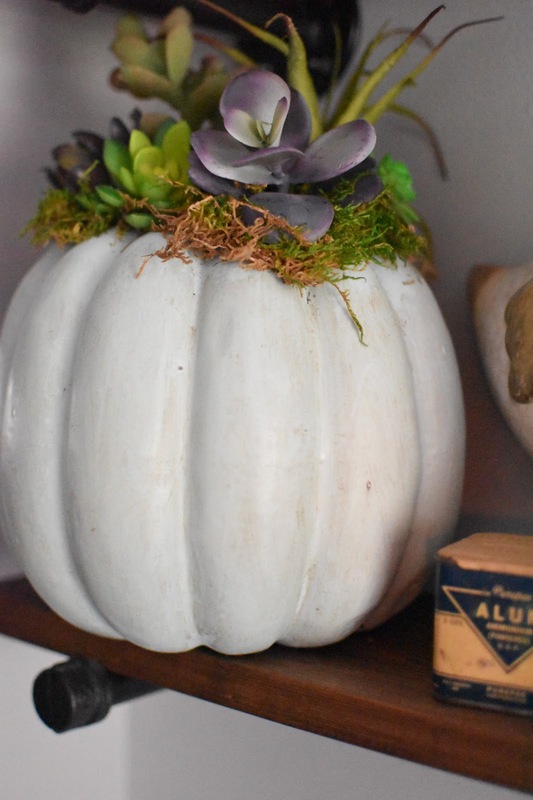 I bought a package of sheet moss and just tore chunks of it off and placed it all around the top of the pumpkin, In between the succulents and under the succulents etc. Just place it anywhere you think it needs a little something extra. Um, can you get any easier than that? 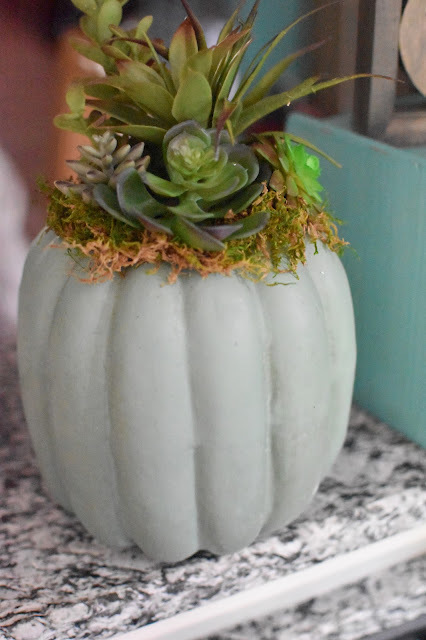 This project may not be the cheapest but it sure is a pretty one that makes it worth spending that money on the succulents! 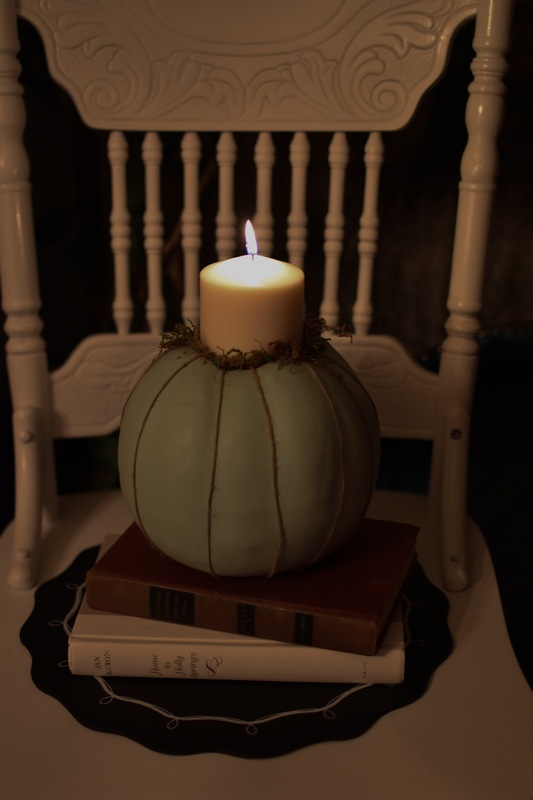 Here are a few photos of the finished pumpkins that I hope you will like! I ended up having one extra pumpkin leftover so I gave it a shot of the Robin's Egg Paint. I then hollowed out the hole at the top and added pieces of twine down along the grooves of the pumpkin just to give it a little interest. 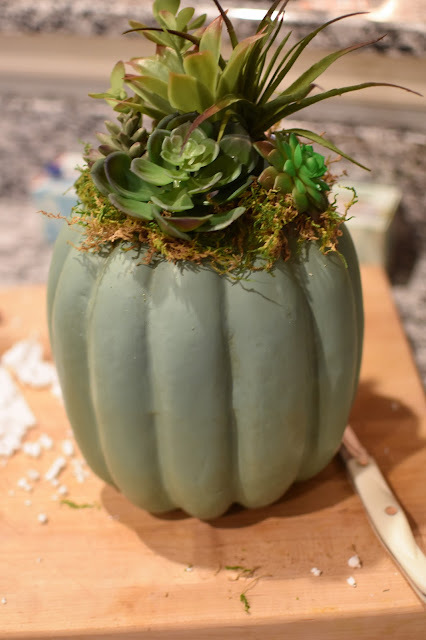 Then I filled the hole with chunks of the moss and placed a small candle in the center of it and then added a little more moss so it was visible from the top of the pumpkin. Now it makes a pretty little glow at night when I light it. Just don't ever leave it unattended! A little disclaimer....I am not responsible for any damage done by following this tutorial. I hope you enjoyed this quick little project and would love to see yours if you make one. This idea was based on @cutertudor's original Instagram post and she said she got the idea from Pinterest. I have put my own twist on it so they may not look the exact same but the idea is similar for sure. I think the next one I will make will be with the faux flowers I bought to originally do mine since I have so many of them.
. . . Instagram . . .
. . . Blog Archive . . .
©2010-2012 Itsy Bitsy Paper. Powered by Blogger.